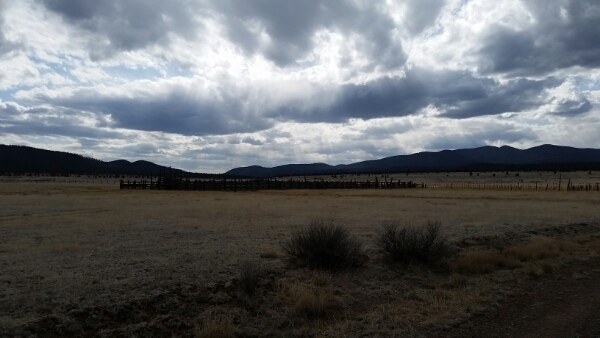 This section was a continuation of the Gila River route, a climb to the Gila Mountains up to 9,600 feet, and to the small , friendly community of Pie Town. 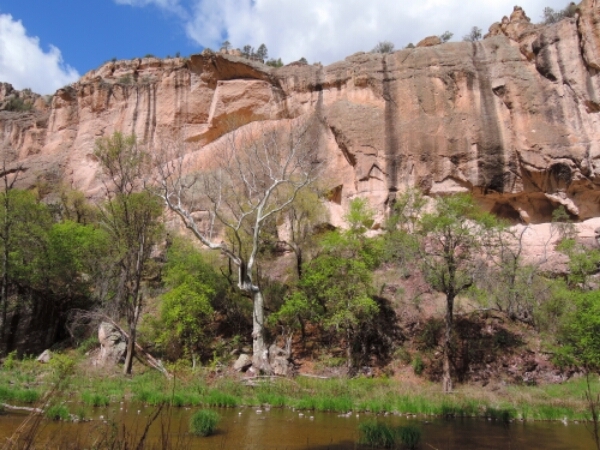 The Gila River canyon appeared to me like a 40 mile cathedral a rock formations that reached to the sky as I made about 200 fords of the shallow river. The beauty and intrigue of hiking a canyon had a price to pay. Many of the crossings were immediately followed by bushwacking through brush that hid what trail may have existed. On the second day I was beginning to look forward to reaching the end of the canyon, but happy I chose this popular alternate route. 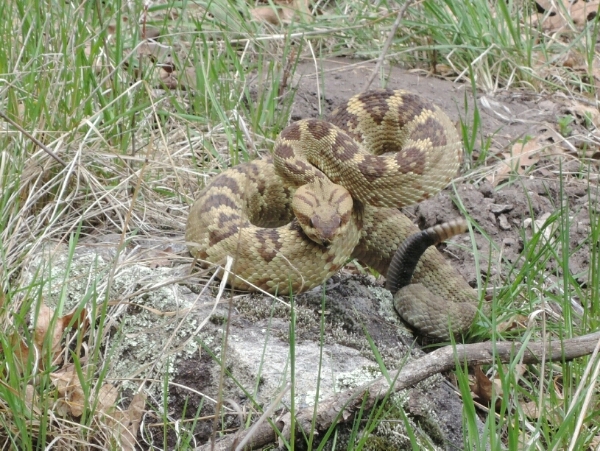 This rattler was big and mean looking! 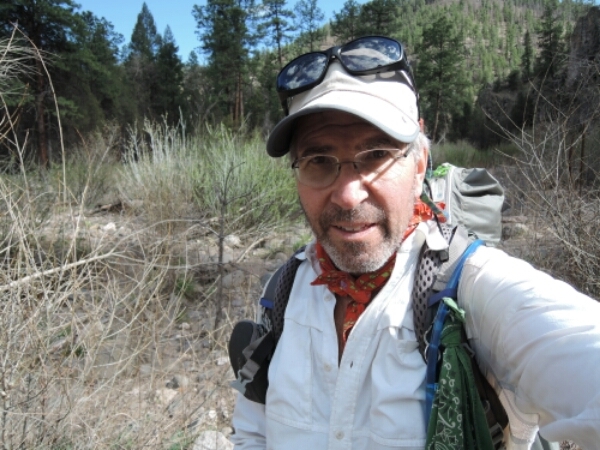 A long road walk after the Gila led me to newly built CDT trail into mixed forests of pine and ponderosa. At times trail led to roads, and one road led to a blazed route that had no trail built yet. I started up this new route but the rocks and downed, burned trees began to hurt my feet. An alternative route existed, so I descended lower and hiked an easy road back to trail that climbed to where I chose to camp at 8,500 feet. While resting at the highest camp so far on my journey, I assessed the wear and tear the 22 mile day inflicted: scrapes, scratches (on top of the ones from the Gila River bushwacking), cuts from barbed wire fences and gates, sandpaper fingers. Just another day on the CDT! There were rewards for the pain. I enjoyed hiking up a road to Mangas Mountain at sunset , where the view from 9,600 feet was a welcome site as I began a long descent toward Pie Town. Ah, Pie Town! The community of CDT hiker was a large one, about 16 by my estimate. 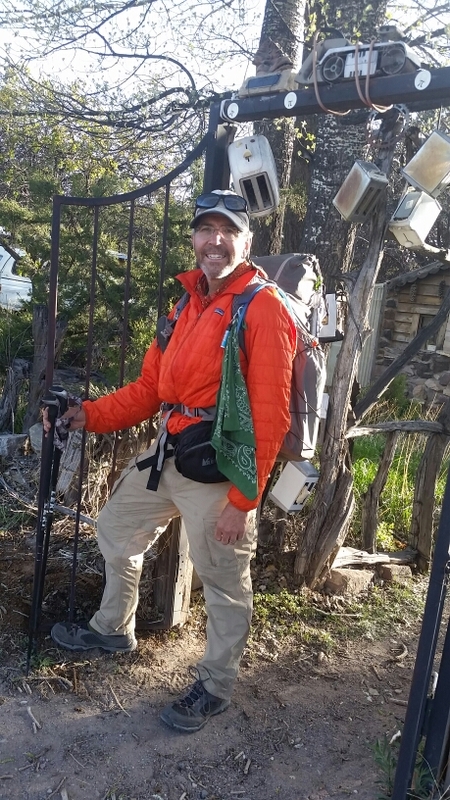 Pie town has several cafes that serve great food and pies and helped fill a calorie deficit that shed over 10 pounds of weight since I started the hike 19 days ago. 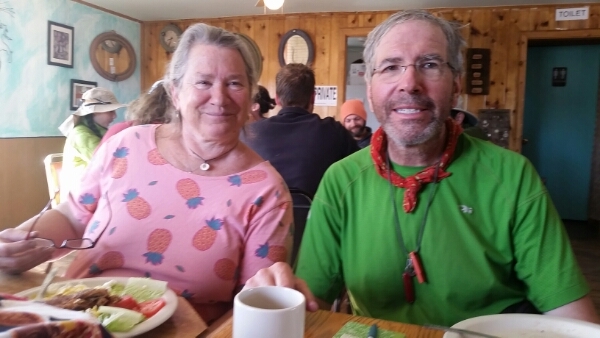 Nita (in photo, above) owns the the Toaster House hostel, and allows hikers and cross country cyclists to sleep, bath, do laundry and cook in the rustic, small dwelling. She is so welcoming the decision to leave here for the trail will be a hard one. Nita was awarded the 2015 Trail Angel of the Year by the American Long Distance Hikers Association West. Day 19, May 6: 20 miles. Miles to date: 316 (11% complete). 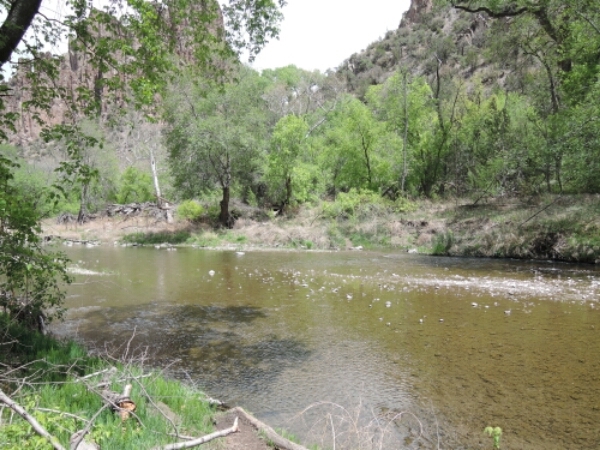 The Gila river looks amazing. Enjoy your time on the trail. Great stories from the CDT! Always look forward to them! Wow! Ten pounds or no ten pounds, you look great! It’s nice to see your smiling face. That’s my rugged hiker guy! You’re doing great. Stay strong!